(partial) Introduction. Physical systems. Control system representation. Response - classical method. Response - state space methods. Performance criterion. Graphical methods. System compensation. Discrete systems - classical method. Discrete systems - state space method. System nonlinearities. Stochastic inputs. Appendix A: Laplace and z-transforms. Appendix B: Symbols, units and analogous systems. Appendix C: Fundamentals of matrix theory. Bibliography. Index. 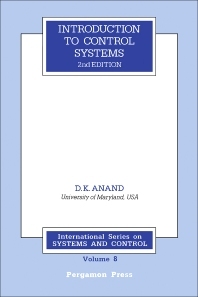 This book is written for use as a text in an introductory course in control systems. The classical as well as the state space approach is included and integrated as much as possible. The first part of the book deals with analysis in the time domain. All the graphical techniques are presented in one chapter and the latter part of the book deals with some advanced material. It is intended that the student should already be familiar with Laplace transformations and have had an introductory course in circuit analysis or vibration theory. To provide the student with an understanding of correlation concepts in control theory, a new chapter dealing with stochastic inputs has been added. Also Appendix\A has been significantly expanded to cover the theory of Laplace transforms and z-transforms. The book includes worked examples and problems for solution and an extensive bibliography as a guide for further reading. For advanced students in systems engineering, control systems analysis, aeronautics and astronautics, chemistry, and chemical, civil and mechanical engineering, and for engineering and university libraries. It is unquestionably an excellent introductory text to the subject matter. The author has done an excellent work on the organization and presentation in writing the book. The concise presentation and clear explanation is a feature of the book. Automatic Control Theory and Application @source: @qu:This book offers an introductory course to control systems to university students at advanced level or to research workers and students of applied sciences. The text is extensive, complete and profound enough to be also used as a reference book for specialists in this field.